Currently, more than 2 billion people (ie, one third of the world’s population) are infected with tuberculosis (TB), of which approximately 10% will develop clinical disease. The incidence of central nervous system (CNS) TB is related to the prevalence of TB in the community, and it is still the most common type of chronic CNS infection in developing countries. Prompt treatment is essential; death may occur as a result of missed diagnoses and delayed treatment. Antimicrobial therapy is best started with isoniazid, rifampin, pyrazinamide; addition of a fourth drug is left to local choice. The optimal duration of antimicrobial therapy is unclear. The benefits of adjuvant corticosteroids remain in doubt: their use in adults is controversial, though they may be indicated in the presence of increased ICP, altered consciousness, focal neurological findings, spinal block, and tuberculous encephalopathy. New research avenues include research into vaccine design, mechanisms of drug resistance, and virulence determinants. Rapid sensitivity testing using bacteriophages considers the problem of drug resistance. Go to Meningitis, Meningococcal Meningitis, Staphylococcal Meningitis, Haemophilus Meningitis, Viral Meningitis, and Aseptic Meningitis for more complete information on these topics. Many of the symptoms, signs, and sequelae of tuberculous meningitis (TBM) are the result of an immunologically directed inflammatory reaction to the infection. TBM develops in 2 steps. Mycobacterium tuberculosis bacilli enter the host by droplet inhalation, the initial point of infection being the alveolar macrophages. Localized infection escalates within the lungs, with dissemination to the regional lymph nodes to produce the primary complex. During this stage, a short but significant bacteremia is present that can seed tubercle bacilli to other organs. In persons who develop TBM, bacilli seed to the meninges or brain parenchyma, resulting in the formation of small subpial or subependymal foci of metastatic caseous lesions. These are termed Rich foci, after the original pathologic studies of Rich and McCordick. Tuberculous pneumonia develops with heavier and more prolonged tuberculous bacteremia. Dissemination to the central nervous system (CNS) is more likely, particularly if miliary tuberculosis (TB) develops. The second step in the development of TBM is an increase in size of a Rich focus until it ruptures into the subarachnoid space. The location of the expanding tubercle (ie, Rich focus) determines the type of CNS involvement. Tubercles rupturing into the subarachnoid space cause meningitis. Those deeper in the brain or spinal cord parenchyma cause tuberculomas or abscesses. While an abscess or hematoma can rupture into the ventricle, a Rich focus does not. A thick gelatinous exudate infiltrates the cortical or meningeal blood vessels, producing inflammation, obstruction, or infarction. Basal meningitis accounts for the frequent dysfunction of cranial nerves (CNs) III, VI, and VII, eventually leading to obstructive hydrocephalus from obstruction of basilar cisterns. Subsequent neurological pathology is produced by 3 general processes: adhesion formation, obliterative vasculitis, and encephalitis or myelitis. 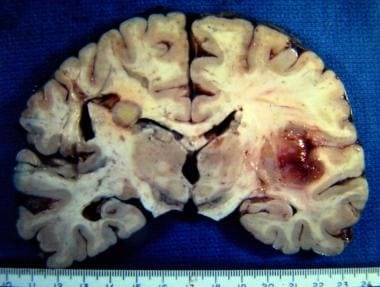 Tuberculomas are conglomerate caseous foci within the substance of the brain, as shown in the image below. Centrally located, active lesions may reach considerable size without producing meningitis. Under conditions of poor host resistance, this process may result in focal areas of cerebritis or frank abscess formation, but the usual course is coalescence of caseous foci and fibrous encapsulation (ie, tuberculoma). In the tuberculous process, the spinal meninges may be involved, owing to the spread of infection from intracranial meningitis, primary spinal meningitis in isolation as a result of a tuberculous focus on the surface of the cord rupturing into the subarachnoid space, or transdural extension of infection from caries of the spine. Pathologically, a gross granulomatous exudate fills the subarachnoid space and extends over several segments. Vasculitis involving arteries and veins occurs, sometimes resulting in ischemic spinal cord infarction. The earliest lesion in the vertebra is invariably due to hematogenous spread, often involving the body of the vertebra near an intervertebral disk. The intervertebral disk is almost always involved with the spread of the disease to the adjacent vertebra and eventually along the anterior or posterior longitudinal ligaments or through the end plate. Soon, a cold abscess develops, either as a paraspinal abscess in the dorsal and lumbar regions or as a retropharyngeal abscess in the cervical region. As the disease progresses, increasing decalcification and erosion result in progressive collapse of the bone and destruction of intervertebral disks, involving as many as 3-10 vertebrae in one lesion, resulting in kyphosis. The abscess may rupture intraspinally, resulting in primary spinal meningitis, hyperplastic peripachymeningitis, intraspinal abscess, or tuberculoma. Papilledema is the most common visual effect of TBM. In children, papilledema may progress to primary optic atrophy and blindness resulting from direct involvement of the optic nerves and chiasma by basal exudates (ie, opticochiasmatic arachnoiditis). In adults, papilledema may progress more commonly to secondary optic atrophy, provided the patient survives long enough. Other causes of visual impairment include chorioretinitis, optic neuritis, internuclear ophthalmoplegia, and, occasionally, an abrupt onset of painful ophthalmoplegia. Sudden onset of focal neurological deficits, including monoplegia, hemiplegia, aphasia, and tetraparesis, has been reported. Although these could be postictal phenomena, they mostly are due to vasculitic changes resulting in ischemia. While some of these could be the result of proliferative arachnoiditis or hydrocephalus, vasculitis still appears to be the leading cause. Vasculitis with resultant thrombosis and hemorrhagic infarction may develop in vessels that traverse the basilar or spinal exudate or lie within the brain substance. Mycobacterium also may invade the adventitia directly and initiate the process of vasculitis. Tremor is the most common movement disorder seen in the course of TBM. In a smaller percentage of patients, abnormal movements, including choreoathetosis and hemiballismus, have been observed, more so in children than in adults. In addition, myoclonus and cerebellar dysfunction have been observed. Deep vascular lesions are more common among patients with movement disorders. The causative organism is Mycobacterium tuberculosis. Various risk factors have been identified. The first description of TBM is credited to Robert Whytt, on the basis of his 1768 monograph, Observations of Dropsy in the Brain. TBM first was described as a distinct pathological entity in 1836, and Robert Koch demonstrated that TB was caused by M tuberculosis in 1882. M tuberculosis is an aerobic gram-positive rod that stains poorly with hematoxylin and eosin (H&E) because of its thick cell wall that contains lipids, peptidoglycans, and arabinomannans. The high lipid content in its wall makes the cells impervious to Gram staining. However, Ziehl-Neelsen stain forms a complex in the cell wall that prevents decolorization by acid or alcohol, and the bacilli are stained a bright red, which stands out clearly against a blue background. Mycobacteria vary in appearance from spherical to short filaments, which may be branched. Although they appear as short to moderately long rods, they can be curved and frequently are seen in clumps. Individual bacilli generally are 0.5-1 µm in diameter and 1.5-10 µm long. They are nonmotile and do not form spores. One of the distinct characteristics of mycobacteria is their ability to retain dyes within the bacilli that usually are removed from other microorganisms by alcohols and dilute solutions of strong mineral acids such as hydrochloric acid. This ability is attributed to a waxlike layer composed of long-chain fatty acids, the mycolic acids, in their cell wall. As a result, mycobacteria are termed acid-fast bacilli. The mechanisms by which neurovirulence may occur are unknown. Human migration plays a large role in the epidemiology of TB. Massive human displacement during wars and famines has resulted in increased case rates of TB and an altered geographic distribution. With the advent of air travel, TB has a global presence. In the United States, the prevalence of TB, mostly in foreign-born persons, has steadily increased. Once infected with M tuberculosis, HIV co-infection is the strongest risk factor for progression to active TB; the risk has been estimated to be as great as 10% per year, compared with 5-10% lifetime risk among persons with TB but not HIV infection. Although patients who have HIV infection and TB are at increased risk for TBM, the clinical features and outcomes of TB do not seem to be altered by HIV. Go to HIV-1 Associated CNS Conditions - Meningitis for more complete information on this topic. Patients infected with HIV, especially those with AIDS, are at very high risk of developing active TB when exposed to a person with infectious drug-susceptible or drug-resistant TB. They have a higher incidence of drug-resistant TB, in part due to Mycobacterium avium-intracellulare, and have worse outcomes. Other predisposing factors for the development of active TB include malnutrition, alcoholism, substance abuse, diabetes mellitus, corticosteroid use, malignancy, and head trauma. Homeless persons, people in correctional facilities, and residents of long-term care facilities also have a higher risk of developing active TB compared with the general population. TB is the seventh leading cause of death and disability worldwide. In 1997, TBM was the fifth most common form of extrapulmonary TB. TBM accounted for 5.2% (186) of all cases of exclusively extrapulmonary disease and 0.7% of all reported cases of TB. Between 1969 and 1973, TBM accounted for approximately 4.5% of the total extrapulmonary TB morbidity in the United States. Between 1975 and 1990, 3,083 cases of TBM were reported by the US Centers for Disease Control and Prevention (CDC), an average of 193 cases per year, accounting for 4.7% of total extrapulmonary TB cases during that 16-year period. In 1990, however, 284 cases of TBM were reported, constituting 6.2% of the morbidity attributed to extrapulmonary TB. This increase in TBM was most likely due to increasing CNS TB among patients with HIV/AIDS and to the increasing incidence of TB among infants, children, and young adults of minority populations. Data suggest that TBM accounts for 2.1% of pediatric cases and 9.1% of extrapulmonary TB cases. TB accounts for approximately 0.04% of all cases of chronic suppurative otitis media. The Tuberculosis: Advocacy Report released by the World Health organization (WHO) in 2003 suggests the persistence of TB otitis, as well as possibly an increase in the incidence of TB otitis. Tuberculomas account for 10-30% of intracranial masses in TB-endemic areas. In 2005, the TB incidence rate was stable or in decline in all 6 WHO regions. However, the total number of new TB cases was still rising slowly; the case-load continues to grow in the African, eastern Mediterranean, and Southeast Asia regions. In many areas of Africa and Asia, the annual incidence of TB infection for all ages is approximately 2%, which would yield an estimated 200 cases of TB per 10,000 population per year. Approximately 15-20% of these cases occur in children younger than 15 years. The worldwide prevalence of TB in children is difficult to assess because data are scarce and poorly organized. The available reports grossly underestimate the true incidence. Lack of surveillance testing in most areas of the world restricts the ability to assess the prevalence of the disease. The developing world has 1.3 million cases of TB and 40,000 TB-related deaths annually among children younger than 15 years. In the developing world, 10-20% of persons who die of TB are children. TBM complicates approximately 1 of every 300 untreated primary TB infections. Prior to the appearance of HIV, the most important determinant for the development of TBM was age. Data published in 2000 revealed that the risk increased with age across racial and ethnic groups. In populations with a low prevalence of TB, most cases of TBM occur in adults. In the United States in 1996, case rates were low in infancy and decreased somewhat during early childhood. After the age of puberty, they showed a steady increase with age. In general, however, TBM is more common in children than in adults, especially in the first 5 years of life. In fact, children aged 0-5 years are affected more commonly with TBM than any other age group. TBM is uncommon, however, in children younger than 6 months and almost unheard of in infants younger than 3 months because the causative pathological sequence takes at least 3 months to develop. Children aged 5-14 years often have been referred to as the favored age because they have lower rates of TB than any other age group. Younger children are more likely to develop meningeal, disseminated, or lymphatic TB, whereas adolescents more frequently present with pleural, genitourinary, or peritoneal disease. Childhood TB has a limited influence on the immediate epidemiology of the disease because children rarely are a source of infection to others. Among persons younger than 20 years, TB infection rates are similar for both sexes; the lowest rates are observed in children aged 5-14 years. During adulthood, TB infection rates are consistently higher for men than for women; the male-to-female ratio is approximately 2:1. Case rates in whites are lowest at all age groups, and rates in Asians and Pacific Islanders are the highest, particularly among adults. Rates among Blacks, Hispanics, and Native Americans/Alaskan Natives are intermediate. Black men have appreciably higher rates than Hispanic and Native American/Alaskan Native men, except in the oldest age group. In 2000, approximately 75% of all reported TB cases occurred in racial and ethnic minorities, including 32% in non-Hispanic blacks, 23% in Hispanics, 21% in Asians and Pacific Islanders, and 1% in Native Americans and Alaskan Natives. Approximately 22% of all reported cases occurred in non-Hispanic whites. Several important factors likely contribute to the disproportionate burden of TB in minorities. In foreign-born persons from countries where TB is common, active TB disease may result from infection acquired in the country of origin. Approximately 95% of cases in the Asian/Pacific Islander group occurred in foreign-born persons, compared with 70% of cases in Hispanics and 20% of cases in non-Hispanic blacks. In racial and ethnic minorities, unequal distribution of TB risk factors, such as HIV infection, also may contribute to an increased exposure to TB or to the risk of developing active TB once infected with M tuberculosis. However, much of the increased risk of TB in minorities has been linked to lower socioeconomic status and the effects of crowding, particularly among US-born persons. TBM is a very critical disease in terms of fatal outcome and permanent sequelae, requiring rapid diagnosis and treatment. The number of deaths due to TB has decreased dramatically since 1953. In 1953, 19,707 deaths from TB were reported in the United States, for a rate of 12.4 deaths per 100,000 population. In 1997, 1,166 deaths were reported, for a rate of 0.4 deaths per 100,000 population. The number of TB deaths and the TB death rate increased slightly during a recent TB resurgence, reaching a high in 1989 of 1,970 deaths and a rate of 0.8 deaths per 100,000 population before decreasing again. Prediction of prognosis of TBM is difficult because of the protracted course, diversity of underlying pathological mechanisms, variation of host immunity, and virulence of M tuberculosis. Prognosis is related directly to the clinical stage at diagnosis. Initially, only clinical indices were used for predicting the outcome, such as level of consciousness, stage of meningitis, bacillus Calmette-Guérin (BCG) vaccination status, cerebrospinal fluid (CSF) findings, and evidence of raised intracranial pressure (ICP). After computed tomography (CT) scanning became available, radiological findings, such as hydrocephalus, infarction, severity of exudate, and tuberculoma, also were considered for predicting the prognosis of TBM. A recent study that looked at clinical parameters, laboratory studies, and CT scan features in 49 adults and children with TBM used a multivariate logistic regression model to show that the most significant variables for predicting outcome in TBM were age, stage of disease, focal weakness, CN palsy, and hydrocephalus. Children with advanced disease with neurological complications have poor outcomes. The occurrence of syndrome of inappropriate diuretic hormone secretion (SIADH) is common and is also linked to a poor prognosis. Sinha et al report that they found visual impediment a predictable prelude to severe disability or death. It was often the result of optochiasmatic arachnoiditis or optochiasmal tuberculoma. Hydrocephalus was the only factor shown to be significant in predisposing patients with TBM who had positive culture results to a poorer outcome. A trend toward a poorer prognosis was also seen in those with advanced stages of the disease. While clinical features in children with TBM who were also infected with HIV and those who were not co-infected with HIV were not markedly different, abnormal radiological findings were more common in the HIV-infected group and outcomes were considerably worse. Coexisting HIV encephalopathy and diminished immune competence undoubtedly contributed to the more severe clinical and neuroradiological features. Health education efforts must be directed at the patients to make them more informed and aware of all aspects of the disease and its treatment. Patients must be informed of the basic rules to prevent spreading the infection to others in the family or the community. Whereas one end of the spectrum of educational efforts is directed toward the health-related behavior of the general public, the other end should be directed toward gaining the support of those who influence health policies and funding of governments and institutions. To achieve this, information, education, and communication (IEC) campaigns should be designed to act as an intermediary between the 2 groups. This strategy includes social marketing, health promotion, social mobilization, and advocacy programs. We do have a successful model of smallpox eradication; if all interested and influential partners come together in a concerted effort, we could and would eliminate TB. For patient education resources, see the Bacterial and Viral Infections Center, Brain and Nervous System Center, and Procedures Center, as well as Tuberculosis, Meningitis in Adults, Meningitis in Children, and Spinal Tap.